The fifth season of House of Cards is little over a month away, and as Frank and Claire Underwood hit up the streets of Washington D.C. to campaign for re-election in typically Machiavellian fashion, over the course of the weekend Netflix premiered four all-new pics via Entertainment Weekly. 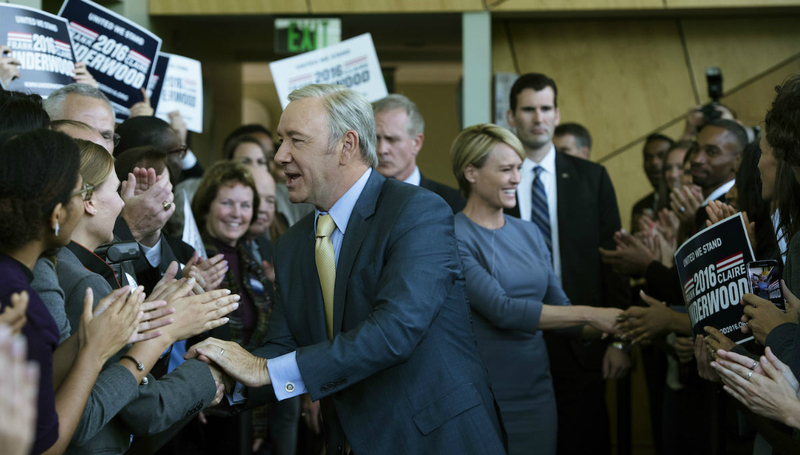 Heralding the return of Kevin Spacey and Robin Wright as America’s most formidable power couple – “we don’t submit to terror; we make the terror” – you’ll also find another peek at Joel Kinnaman as the towering Will Conway, a fierce opponent to the Underwoods who started to make in-roads into the White House in season 4. Expect that rivalry to reach new heights with the premiere of season 5 on May 30th, and if you’re beginning to develop a sense of déjà vu following the real-life American election of 2016, executive producer Melissa James Gibson stressed to EW that House of Cards doesn’t draw too many parallels with the current political climate. Sure, the resonance sometimes feels eerie. But Trump is an outsider who’s trying to blow up the system, and Francis is the opposite. After delivering a chilling message to the audience at the tail-end of season 4, when both Frank and Claire declared war on the terrorist cell known ICO as a means of directing attention away from the Hammerschmidt scandal, we can’t wait to see what the fifth season has in store. Michael Kelly, Jayne Atkinson, Neve Campbell, Derek Cecil and Paul Sparks co-star. Season 5 of House of Cards will premiere via Netflix on May 30th. Will you be tuning in to discover how the Underwoods’ campaign for re-election unfolds? Do let us know.